You know the type…. they have loud conversations between themselves, making jokes, so that everyone will look over at them and acknowledge their WHACKYNESS witha a laugh or a “those guys are crazy” kind of comment. What they don’t realize, is that they are obnoxious and everyone in the bar would probably offer to buy them drinks so that they both pass out and shut up! In my lonely boredom, I chose to tweet the comments that these guys were making, especially to the female bartender, who by the way, was just as sick of them as the rest of us around the bar. 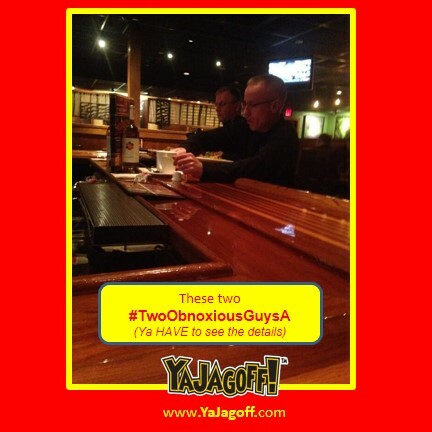 As I tweeted more and more with the hashtag #TwoObnoxiousOldGuysAtBar, more people started to jump in on the twitter feed. I was no longer bored and even had to order another unwanted beer just so I could sit at the bar and tweet the Jagoffery of Willy Lowman and his wannabee buddy. Not all tweets are below but I’ve tried to recapture the fun. I have to tell ya, the twitter-er-ers that got involved made my night! To which this response came. @YaJagoff I just knew it 🙂 Do the guys look like they should be in an ATT ad? As in “did it hurt when you fell from Heaven” commercial? NOTE: If I would have done that, I would have been unconscious on the floor within 20 minutes. Those are the worst. They think they’re funny and expect you to think they’re funny; then get mad when you don’t. This thing went on for 45 minutes! 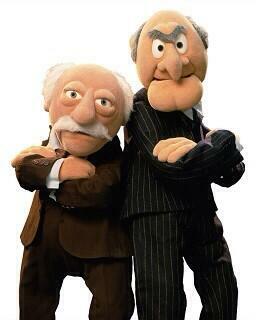 The bartender said those two guys had been there for 4 hours! The next day, this is the tweet that I got from the bartender..
#TwoObnoxiousOldGuysAtBar they were the worst. Made me want to go all Mexican and cut someone. Funny thing.. some Twitter-er-ers like @poycer and @spode411 got in on the conversation late and starting retweeting the conversation all over again after I was long gone.